Here begins the tale of the Battle at Badon Hill. It is an ancient tale, and I pray my telling of it be pleasing to all. Long ago, after Arthur had drawn the sword from the stone in London, there were many of the Great Barons who would not recognize him as King, so Arthur was forced to wage war with them. He and his supporters fought in twelve battles, and with each, he gained new followers. And as Arthur's numbers swelled, the rebellious Great Barons allied themselves with the invading Saxons, which caused much hatred on the part of the people of Britain. After the eleventh battle, Arthur grew frustrated, fearing that he would never be able to win the loyalty of the Great Barons of Britain. It was on the eve of Vernal Equinox, at his camp near Badon Hill, as he prepared to again battle the Great Barons, that Merlin came to him and said, "My lord, what you need is a sign to show the Barons that you are indeed destined to be their liege." "I drew the sword from the stone," said Arthur. "Was that not sign enough for them?" "In the days of old," said Merlin, "kings received the blessing of sacred kingship from the Maidens of the Wells. This was a sign unto all, which no one could dispute." "I have heard this," said Arthur. "But the Maidens of the Wells have been lost to our lands for many years." "This is true," said Merlin. "Nevertheless, you shall have the blessing." And that is all that Merlin would say before he disappeared into the evening fog. Early the next morning, before even the Sun had risen, Merlin returned and came to the King. "My lord, it is time." And without another word, he led Arthur away from the camp and into the forest. The King questioned Merlin many times, but the wise old man would only smile and walk onward. At last they came to the shore of a mist-shrouded lake, and Arthur followed Merlin into a small boat, which of its own drifted to the center of the lake. And as the Sun rose on the morning of the Vernal Equinox, painting the mists in hues of pink, Arthur saw rising from the water a fair maiden's hand, clad in shimmering samite and holding aloft the most beautiful sword Arthur had ever seen. At a nod from Merlin, the King reached out and took the sword, and the hand vanished into the water. "What does it mean?" whispered Arthur, marvelling at the sword. "That is the sword Excalibur," Merlin said, as the boat drifted to shore. "The ancient sword of kingship, lost to this world since the Grail's withdrawl. It has been given to you by the Lady herself." Arthur was speechless as Merlin led him back to the campsite. 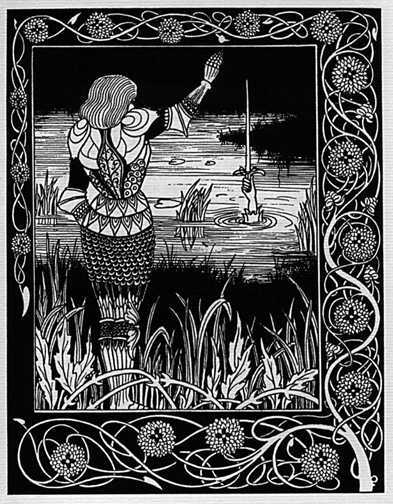 That day Arthur won his greatest victory, for as he wielded his sword in battle, he shouted aloud, "Behold the sword Excalibur, given me by the Lady of the Lake, signifying that by divine right, I am to be King of all Britain!" When the men of the Great Barons saw the sword Excalibur, they fled from the King. After that the battle went badly for the rebel Dukes, and at last they sued Arthur for peace. They met atop Badon Hill, and each warlord bowed down before Arthur and his sword. Duke Uriens of Gorre spoke for the others: "By the sign of the sacred sword Excalibur, we see now that you are indeed destined to be our lord and King. We offer our fealty to you, Arthur Pendragon of Britain." Arthur accepted their fealty and forgave them their rebellion. He gave them each their lands, to rule in his name. And on the site of the treaty, he chose to build his magnificent castle, which men called Camelot. Here ends the tale of the Battle at Badon Hill. May the Blessed Spirit of Arthur be pleased with my telling of the tale, and may my ancestors smile upon me, now and ever.